A group of alien adolescents is rescued from a training accident, but one of them turns out to be a human who was taken from his parents at a young age. When the boy's adoptive father demands his return, Picard faces a hard choice. Troi could have spoken up a little earlier about there being "failing" life on board the vessel, rather than waiting for Data to give the captain a Talarian history lesson. How can Picard not be familiar with Stockholm Syndrome? Aren't Starfleet officers trained to deal with captivity? Could they have possibly found a more annoying sound for the kid to make than the B'Nar? The scene with Worf feels like a missed opportunity. There's room for an interesting dichotomy between Jeremiah and Worf, but it's left unexplored. The implied abuse is unnecessarily provocative and takes away from where the story is trying to go. If Jono had been abused by his adoptive father, there wouldn't be much of an ethical quandary, and the conclusion--Picard returning Jono to the Talarians--would be downright horrifying. I can appreciate what this episode is trying to do by putting Picard in the position to act as a father figure to Jeremiah. It confronts Picard's idiosyncratic discomfort around young people, and it gives him a mirror of sorts, someone else who has been assimilated by an alien society and must learn to cope with it. 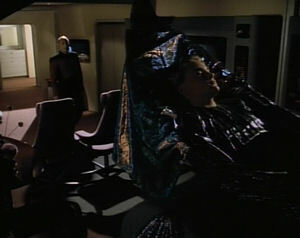 Unfortunately, the story never quite gets there; Picard never shares his own feelings about the Borg to help Jeremiah. A lot of that has to do with this episode coming so quickly after "Family," which dealt with Picard's raw emotions. If this story had waited a while or chosen to focus on a character other than Picard (like Wesley or Worf), it might have worked much better. As it stands, though, it's a weak episode that fails to go anywhere interesting (though I do like the ending), and it pushes the "bottle show" drama too far. Three episodes in a row with little action or sci-fi is too many, so here's hoping the next episode gets back to the more traditional Star Trek formula.